Black and white negative showing the construction of the new sewage treatment plant. In this image, the workers are excavating for one of the tanks. 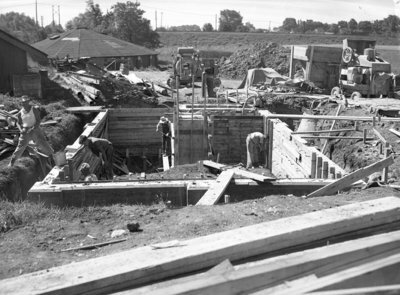 Construction of Sewage Treatment Plant, 1948, Marjorie Ruddy, Whitby Archives, A2013_040_1622. Scanned from black and white large format negative.